It is easy to understand that if you get home automation or video monitoring that ADT Pulse makes sense, but what are the benefits of ADT Pulse if you just get the security system features only? There are seven things that make ADT Pulse for home security our most popular customer option for ADT Monitoring. In fact, over 50% of our customers choose ADT Pulse Monitoring and of those 80% choose to go with Level 1 Pulse which is security system features only. The other 20% of our ADT Pulse customers upgrade to Level 2 Pulse which adds ADT Pulse cameras with video monitoring or decide on Level 3 Pulse which includes home automation. These seven benefits make ADT Pulse the favorite of our customers and especially when it just adds only $5 to the monthly monitoring service. ADT Pulse Level 1 certainly provides the best value for home security today. With so many of us being connected to the world through our smart phones, mobile devices and computers, it makes sense that you should be able to manage your security system remotely and get immediately notified if an emergency happens. Over half of the homeowners who own security systems forget to arm their alarm system daily. What good is a home alarm system if it is not on? With ADT Pulse you can remotely check the status of your alarm and arm or disarm it at any time. Spouse or kids forgot to arm your security system today... no problem. On vacation, sipping a Maui Tai and just remembered that you forgot to arm your home security system... no problem. You can even program the ADT Pulse system to notify you if the security system is not armed by a certain time each day or anytime the system is armed or disarmed. With ADT Pulse you will have peace of mind knowing that everything at home is fine from virtually anywhere. The text and email notifications keep you in touch with what's happening at home. Be notified when something happens, when something does not happen and most importantly be immediately notified of all home emergency events. You program what and who you want to be notified of on your personal web portal. Be notified everytime your home security system is armed or disarmed, when it has not been disarmed by the time your kids are supposed to be home from school or when a certain door is opened or closed. You can be notified of all alarm events, security devices events and when you add ADT Pulse Cameras you will have the ability to attach video clips to your text and email notifications. The ADT Pulse personal web portal makes the management of your home security system incredibly easy. It has a very user friendly interface with simple to understand dashboard and drop down menus. 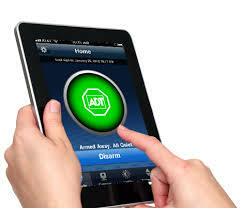 The iPhone, iPad and Android Apps makes remotely managing your home security system so simple. In fact, you will find yourself arming and disarming your security system from your phone even when you are home. You will use your personal web portal to program your security system automations and schedules. You can also review the history of alarm events and device events. From the web portal you can manage users and access of the ADT Pulse system. The web dashboard gives you a summary of your security system including the status, homeview, today's schedule, devices and video clips and pictures if you have ADT Pulse cameras. To learn more about the ADT Pulse and your Personal Web Portal visit our security blog.